Battlefront has a new featured article up. This one's for the M109 tank for Tour of Duty. 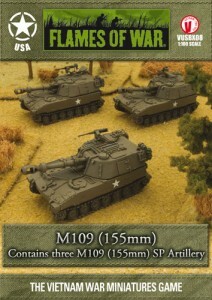 M109 (155mm) (VUSBX08) includes three M109 (155mm) Self-propelled gun with M108 (105mm) option, four Vehicle commander figures, one M109 decal sheet & twelve rare earth magnets.